Your Alison Certificate is formal recognition of your learning. Once you become an Alison Graduate you can choose to purchase your officially branded and security marked Certificate. 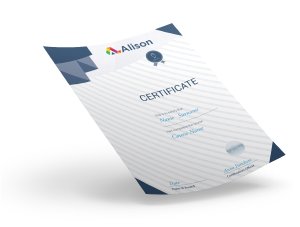 Alison Certificates can be co-branded. We offer a tailored solution where certificates may be purchased in bulk, in advance at a discounted rate. Choose from either a Digital Certificate or a Printed Certificate. Printed Certificates have a framed option. The learner can access their Certificate by redeeming a voucher, which is produced when the company/organisation pre-pay on their behalf. Where your organisation is a large volume purchaser of Alison certification services, we are happy to arrange a volume discount with your organisation directly. Volumes for Certificates must be over 250 Certificates within a one year period. We require an upfront percentage payment. An Alison API connection seamlessly links your website/internal system to the Alison suite of courses with a single sign on. We can work with you to format reports that facilitate your needs. We offer you the option to pre-pay in bulk for Alison certificates for your graduates at a discounted rate.